The Remote Spectrum Monitor MS27102A is designed to both mitigate interference problems and identify illegal or unlicensed signal activity. It is a full-featured platform for monitoring and recording signals in user-specified frequencies and is capable of sweep rates up to 24 GHz/s, enabling this probe to capture many types of signals including periodic or transient transmissions as well as short “bursty” signals. The 20 MHz instantaneous FFT bandwidth available on the Remote Spectrum Monitor MS27102A provides the ability for wideband, real-time captures of signal activity for subsequent post-processing. IQ captures can be recorded both in block mode or streamed. A “save on event” feature is also provided to capture spectrum measurements only when certain user-specified thresholds are violated, which saves memory space since only signals of interest are captured and recorded. 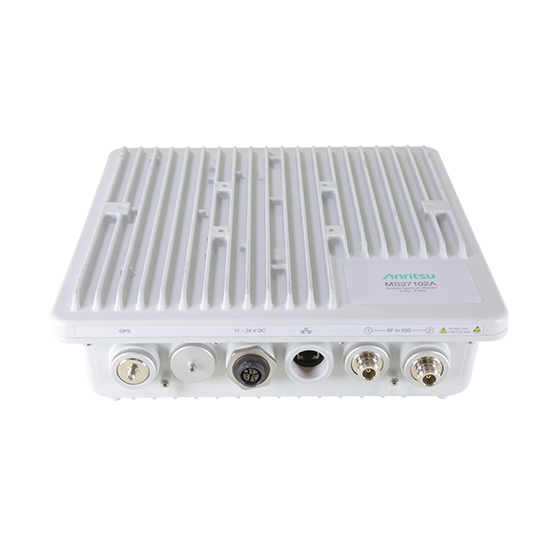 The Remote Spectrum Monitor MS27102A is offered in a weather-proof IP67 enclosure for outdoor mounting in the harshest of environments, and comes standard with one RF Input, although a second port can be optionally added for use with two antennas. With an integrated web server, a user from anywhere in the world can log in to the spectrum monitor and control any of its features using an internet browser (Chrome and FireFox supported). This includes frequency setting, RBW/VBW control, reference level configuration, and many other settings relevant to the user’s spectrum monitoring application. Trace data, spectrograms, and other measurements can also be viewed. Because it is operating system platform agnostic, any electronic device capable of rendering a browser will work with the web server. PCs/laptops, tablets, and even smartphones can be used to view spectrum and adjust remote instrument settings. Each monitor also features Gbit Ethernet, allowing fast transfers of measurement data and control information. Users can also write their own monitoring program using available SCPI commands. Anritsu provides a user manual listing each SCPI command, a description of the commands, and the correct syntax required for each command. Additionally, each individual pair of IQ data output by the monitor is time-stamped using high-precision GPS signals. This enables the user to use IQ data for Time Distance of Arrival (TDOA) applications for geo-locating signal positions. IQ data time stamp resolution is less than 9 nsec for precise signal location calculations. Vision™ software is also provided as an option for the Remote Spectrum Monitor MS27102A. It works with the monitoring hardware to automate the process of collecting measurement data, as well as providing useful information about network heath and use of the spectrum. Vision software is composed of two components responsible for monitoring and locating interference signals. Vision Monitor automatically records spectrum data, maintains a searchable spectrum history database, enables alarm functions for unusual signal activity, automatically sends email alerts, and provides a set of tools for managing the spectrum monitoring system. Security at military facilities, national borders, utilities, airports, etc. Communication with the MS27102A is done via the GBit Ethernet port located on the instrument. Options are provided for using DHCP to obtain an IP address dynamically or for setting up a static IP address. The instrument is shipped with the default static IP address of 10.0.0.2. Once a connection is made to the instrument via a laptop/PC, the IP type can be changed via the user interface presented by the monitor’s integrated web server.